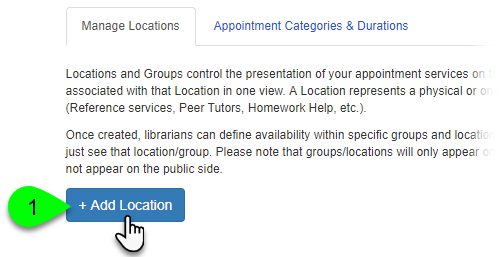 Locations and Groups control the presentation of your appointment services on the public side of the system. Patrons will first select the Location where they'd like to make an appointment, and will then see all groups associated with that Location in one view. A Location represents a physical or online location (like a branch, campus building, etc. ), while Groups generally represent the types of services offered at that location (Reference services, Peer Tutors, Homework Help, etc.). Once created, librarians can define availability within specific groups and locations and/or at all groups within a location. On the public side, if only one location or group exists, patrons will skip the selector menu and will just see that location/group. Please note that groups/locations will only appear on the public side once staff have created availability; if no staff have marked themselves as available at a particular group/location, it will not appear on the public side. 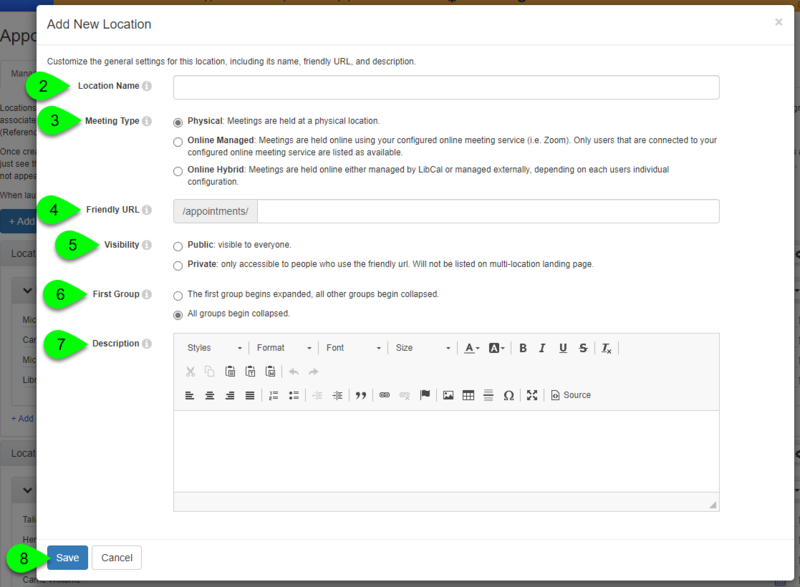 To create and manage your locations and groups, go to Admin > Appointments. Staff members can divide up their availability times by location, which can be helpful in cases where you have staff from multiple branches, campuses, or libraries sharing a single system. Not only can you organize staff by location, this also makes it easy for a single staff member to set up different availability times in multiple locations. For example, if you have a reference librarian who visits your main campus and downtown campus, she could have separate availability times for each. 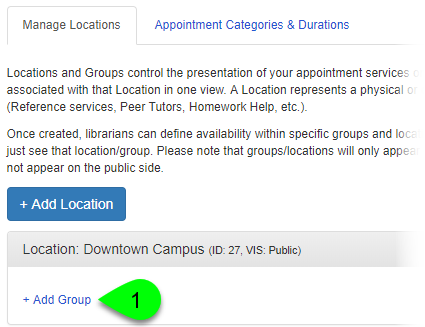 Because each location has its own appointment booking page, patrons at the Downtown location will only see that librarian's availability when she's on that campus, and likewise with the Main campus. Under the Manage Locations tab, click on the Add Location button. In the Add New Location window, enter the name of this location in the Location Name field. In the Friendly URL field, you can give this location its own customized URL. Although optional, this will make it much easier to link to and share the URL to this location's public appointment booking page. The text you enter here will appear after /appointments/ (e.g. yourlibrary.libcal.com/appointments/my-friendly-url). Important note: friendly URLs are case sensitive and can only contain letters, numbers, underscores, and hyphens. For best results, we recommend using all lowercase letters. Use the Visibility options to determine whether this location's appointment booking page will be public or private. Public: the page will be visible to all users and included in the list of available locations on the appointments landing page. Private: the page will not be listed on the appointments landing page. It can only be accessed directly via its URL (we recommend using a Friendly URL with this option). Locations can contain one or more groups of staff members, each displayed inside of a collapsible panel. 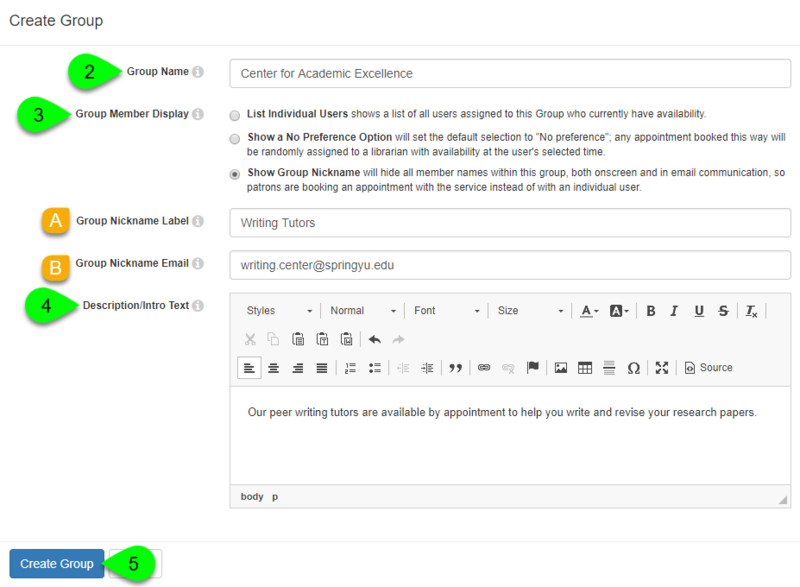 You can use the First Group option to choose how the first group in the list displays on the public appointment page. The first group begins expanded, all other groups begin collapsed: when you select this option, the first group's panel will be expanded by default. The panels for each other group will be collapsed. This option can be helpful if you want the first group in the list to have the most visibility. All groups begin collapsed: all of the group panels will be collapsed by default. Optionally, you can use the Description text box to provide information about this location. The text added here will display at the top of that location's appointment booking page. Click on the cog () button in the location's heading. To edit the location's name, friendly URL, visibility, and other options, select Edit Location from the dropdown. To access the location's public appointment booking page, select View Public Page from the dropdown. To reorder the location's groups, select Re-order Groups from the dropdown. This will open a window where you can drag and drop the groups into a new order. To permanently delete a location, select Delete Location. CAUTION: This will also delete all groups, availability, and bookings added to the location and cannot be undone, so be careful! You will be prompted to confirm before the location is actually deleted. This will indicate how many bookings (if any) will be deleted. Within each location, you can add one or more groups of staff members. Groups allow you to organize your staff, such as by service area or subject specialty. For example, you could have a group for Research Help, Writing Help, Technology Help, etc. On a location's public appointment page, each group will appear as a collapsible panel. Patrons can click on the group's panel to expand it and view the availability of the staff assigned to that group. Click on the location's Add Group link. In the Create Group window, enter the name of this group in the Group Name field. 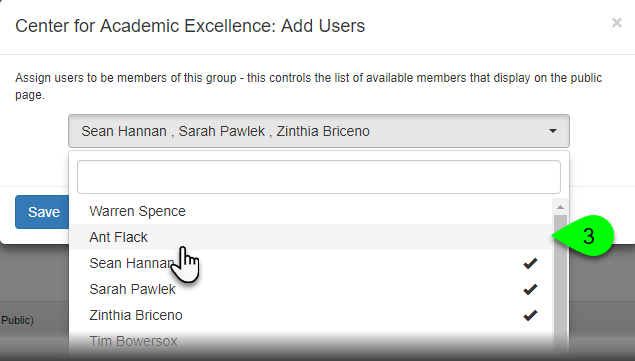 Use the Group Member Display option to customize how staff will be listed inside the group. List Individual Users: all staff members assigned to the group who are currently available will be listed. Show a No Preference Option: in addition to listing all staff individually, patrons will also be able to select a "No Preference" option. This will allow the patron to book an appointment with a randomly selected staff member who is available at the selected time. Show Group Nickname: when this option is selected, staff members will not be listed individually. Instead, patrons will see a single option for the group's nickname. Similar to the "No Preference" option, patrons will book an appointment with a randomly selected staff member who is available at the selected time. The only difference is that patrons will not be given the option of selecting a specific staff member. Enter the group's nickname in the Group Nickname Label field. This will be displayed on the appointment booking page and in all patron email notifications from this group. It will also display in parentheses next to the group's name on the Manage Locations page. Enter an email address for the group in the Group Nickname Email field. This will act as the reply-to address for all patron email notifications from this group. Optionally, you can use the Description text box to provide information about this group. The text added here will display above the group's the list of staff members on the public appointment page. Click on the cog () button in the group's heading. 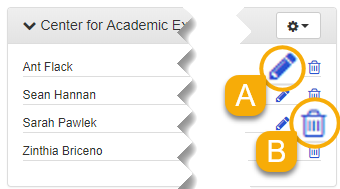 To reorder the users assigned to the group, select Re-order Users from the dropdown. To edit the group's name, display options, and description, select Edit Group from the dropdown. To associate specific appointment categories with this group, select Associate Categories from the dropdown. This will open a window where you can select which categories of appointments users can make in this category. Need more info about appointment categories? Check out the Links & Files section below. To access the group's public appointment booking page, select View Public Page from the dropdown. CAUTION: This will also delete all availability and bookings added to the group and cannot be undone, so be careful! You will be prompted to confirm before the location is actually deleted. Once you've created a group, you can begin assign users to it. After a staff member has been assigned to a group, they will be able to then add their availability times to the group. Each group can contain multiple users and each user can be assigned to multiple groups. Click on the group's cog () button. From the dropdown menu, select Add Users. In the Add Users window, use the dropdown to select the users you want to add to the group. To view a user's availability times and Appointments settings, click on their pencil () icon. To remove a user from a group, click on their trash can () icon. 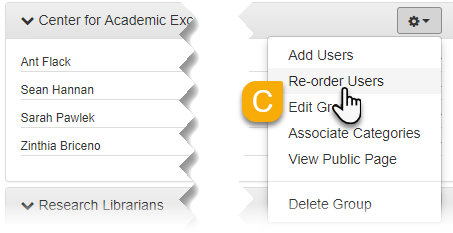 To reorder users assigned to the group, click on the group's cog () button and select Re-order Users from the dropdown.